Here in Northfield, Minnesota it is a chilly (and welcomed by me) 50 degrees with about 25 to 30 mph winds (not welcome). We found out it is quite gusty here in the Fall and winter. I may be the only one inviting this weather but mind you, I am not inviting winter. I wish I could move before that funfest starts. Bring on SAD (seasonal affective disorder) again. I am both ecstatic and gloomy when it becomes Fall and chilly because I love all that is Fall but then leaves disappear and suddenly, absolute frigidness of winter is upon us. One day it could be in the 50’s and then wham, 20 and it doesn’t go back to 50’s for six or more months. You never know when this could happen here in southern Minnesota. Dontcha know? I think living in town will be a big problem in about a month. There is no parking overnight on the street, with or without snow, from November 15 to March 15 and the parking lot behind our apartment building is reserved for stores and does not have snow removal. (Yes, I am talking about my frustrations with the town again.) Reserved for stores although it has at least three spots stating ‘tenant parking’ but our landlord mentioned that if a business comes in below us that will not be the case. Plus, there are more tenants than parking. Then there’s the public option that can be parked in by permit only a few blocks away (that walk will be fun at 20 below this winter). We turned in our application for two permits-we shall discover if we are allowed to have a car or two in town (that’s how I see it). If not, what do they expect us to do with our vehicles, not to mention jobs and lives? I am not walking miles and miles to get to an overpriced grocery store, a mildly-priced grocery store, maybe. To prepare for this, we are trying to sell our Forester (I love it but the AWD doesn’t work and winters require that here) and eventually we’ll sell the truck my dad gave to us (with his blessing) so that we can get another Subaru with AWD intact. I love Subaru vehicles. I can see my future dogs in the back already and future trips on trails to boot. We’ve had some good times with the old all wheel drive. We spent most of the weekend working on the blog, walking around town and gathering a lot of vegetables for upcoming meals. I feel like I had a productive Sunday. I updated my recipe book, which is a 2-inch green binder with all of my treasured finds and a section for holiday and “to try” recipes as well. We went to the farmer’s market Saturday. I bought three butternut squash for $5 so I made the most of those and used two for bisque/soup. The other is for a recipe later this week. I was never a squash eating child or adolescent and bisque never met my mouth in those days but I am singing its praises today. Unless you consider baby food as a sort of bisque and then I am sure I have had it before. 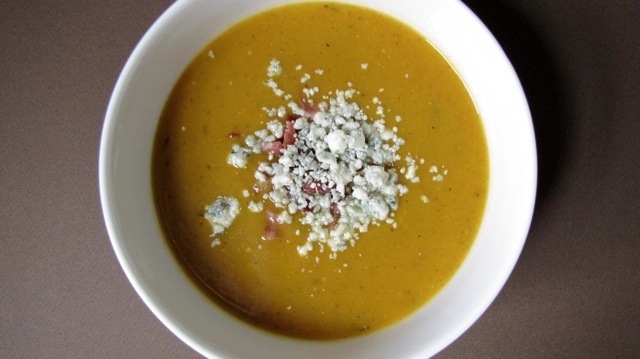 I came across James Starmer’s butternut squash soup recipe on his site but changed a few things. I think butternut squash pairs well with apple so I made the puree with a Fuji (not Lauren Hill but I guess that’s a Fugee). You begin by making a puree which requires baking the squash and apple with a few other things and then add cream and/or broth into the puree until you reach your desired consistency. This is so easy and yet looks pretty impressive. Give it a try, especially if you haven’t had squash in quite some time or ever. Heat oven to 400 and place squash, apple and rosemary or sage into a roasting pan. Place bacon over the top and bake for 40-60 minutes until soft. Cool (remove bacon and fry until crisp for topping) and then add to a food processor (with ½ to 1 cup broth) and puree. Add to a saucepan with the remaining broth, add cream (optional), salt, nutmeg and cinnamon and simmer at desired consistency. Serve hot with whatever topping you would like (see above for recommendations). I topped mine with bacon and blue cheese and Greg loved it with honey drizzled around the top.